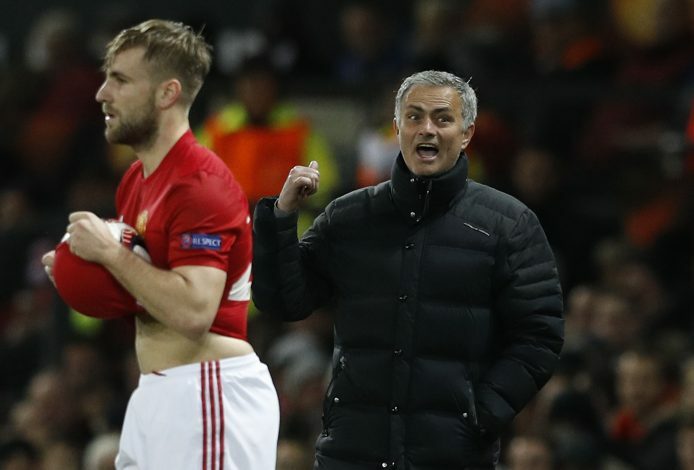 Manchester United boss Jose Mourinho has revealed that Luke Shaw remains very much a part of his plans this season, and that there is ‘no problem’ between the two. Shaw recently returned from injury by featuring in Man United‘s 4-0 win over Wigan in the FA Cup, but he has since been overlooked by the Portuguese manager for the Red Devils’ subsequent games against Hull, Leicester City, and Watford, thereby concerning a few supporters. The young left-back’s future at Old Trafford has already been under serious doubt for quite some time now, due to his consistent injuries, along with Mourinho himself publicly criticizing the England international on numerous occasions. Furthermore, in the absence of Marcos Rojo last Saturday, Jose selected Daley Blind to start at left-back against Watford, with Matteo Darmian on the bench – indicating the fact that Luke Shaw was now fourth in the pecking order for the LB position, and on the fringes of Mourinho’s team selection plans. However, the former Chelsea boss has now revealed that Shaw’s time to shine will soon arrive, as long as the 21-year-old continues to work hard and remain patient. “He (Shaw) has to work and wait,” Mourinho stated after Man United‘s win over Watford (via MEN). “But today I want one defender on the bench and the defender on the bench is somebody who can play more than one position. And Darmian can play left-back, right-back and would be an emergency central defender for us, so my choice was Darmian. Manchester United is playing a lot of cups, so players must give chances to each other please coach.